Molluscan hemocytes serve a variety of functions. 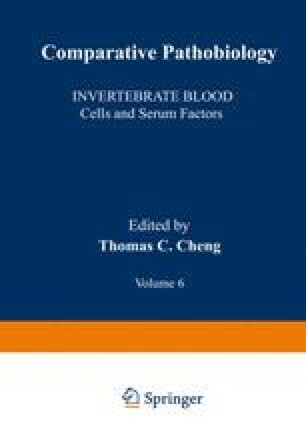 It is known that these cells are involved in wound repair (Pauley and Sparks, 1965; des Voignes and Sparks, 1968; Pauley and Heaton, 1969; Ruddell, 1971b), shell repair (Wagge, 1951, 1955), nutrient digestion and transport (Yonge, 1923, 1926; Takatsuki, 1934a; Yonge and Nicholas, 1940; Zacks and Welsh, 1953; Wagge, 1955; Zacks, 1955; Owen, 1966; Purchon, 1968; Cheng and Cali, 1974; Cheng and Rudo, 1976; Cheng, 1977), excretion (Durham, 1892; Canegallo, 1924; Orton, 1923), and internal defense, i.e., cellular immunity (Stauber, 1950, 1961; Tripp, 1958a; b, 1960; Feng, 1959, 1965; and critical reviews by Cheng, 1967; Cheng and Rifkin, 1970; Cheng, 1979). The original information included in this contribution had resulted from research supported by grants (PCM77-23785, PCM82-08016), from the National Science Foundation.